Roberto Luongo has a pretty promising streak going. He’s won seven of his last eight games, and the only blemish on that record is a 2-1 loss to Columbus in shootout. In contrast to the first few months of his season, which were marked by erratic play, goals-against averages in the 4, 5, and even 6 range, and an increasing desperation in Vancouver, Luongo’s performance this month has been significantly more consistent. His most recent games have been particularly satisfying: a 33-save shutout win against Minnesota (the team battling Vancouver right now for Northwest Division supremacy) on Monday, and a 38-save 4-2 victory Wednesday night over dangerous Detroit, which included these two saves within about 20 seconds of each other. “I’m feeling good,” he told the media Monday, but stopped short at pumping his own tires. Asked if he would evaluate his recent stretch, he responded, “I’ll leave that up to you guys to judge. I just play the game. You guys are the writers, so you guys can figure that one out.” Which funny face do you think he was making during that remark? Luongo had gotten himself into some trouble this June when he took reporters up on the opportunity to pass judgment – not on his own play, but on that of Stanley Cup Finals opponent Tim Thomas. After the Boston goaltender gave up a Game 5 game-winner, Luongo evaluated the situation by saying it would have been “an easy save” for a stay-at-home goaltender like himself. (Thomas moves around much more.) His comments, in context, weren’t as dickish as the soundbites made them seem, but they inspired his opponent nonetheless. “All that did was give me confidence that his head was in the wrong place,” Thomas recently told WEEI.com, which named him Boston’s Sportsman of the Year. (The piece on Thomas, written by DJ Bean, is recommended reading.) “I was focused on stopping the puck and he was thinking about my style,” he said. The Bruins won Games 6 and 7, and Thomas was named playoff MVP. The Washington Capitals’ Michal Neuvirth is expected to make his fourth straight start Friday night against the New Jersey Devils. With Tomas Vokoun struggling in net — Caps’ owner Ted Leonsis wrote a succinct blog post that began: “Our goal tending wasn’t very good” after a 5-1 loss to Philly earlier this month — the door has been opened for Neuvirth to continue to start. As the Washington Post’s Katie Carrera notes, getting into a multi-start rhythm is essential for most goalies to reach their peak form. Until now, Neuvirth had only made back to back starts once all season. In the three games he’s been in net over this past week, he’s had a shutout and two wins. With Washington struggling to climb its way back up the standings after a dismal start to the season and the Devils holding onto the no. 8 spot in the Eastern Conference, Friday’s game will be a pivotal start for the 23-year-old goalie. Do yourself a favor and check out this old picture of a 5-year-old Marty Brodeur playing street hockey. If you’re wondering why such a professional-looking photo exists of some kid out front of his house, well: his father was the Montreal Canadiens’ team photographer. I enjoyed this glove save by the Sharks’ Antti Niemi. And leading up to the Winter Classic, goaltenders on both teams helped design custom helmets for the game. New York’s Henrik Lundqvist wanted something that looked “like a mask that has been laying in the attic for 30 or 40 years,” while backup Marty Biron opted to pay tribute to former Ranger Gilles Gratton’s memorable mask with a lion motif. Hey, they say animal prints are in! As for Philadelphia, Ilya Bryzgalov is going with a celebration of all things Philadelphia— including the Philly Phanatic. (“We had to explain that to him,” the mask designer said.) 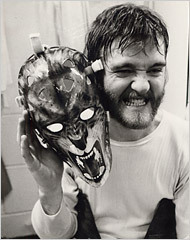 Even Bernie Parent is getting some custom work done — he will wear his old-timey masks during Alumni Game warm-ups and practice. And we’ll end on this: Behold the Florida Panthers’ talented 21-year-old “franchise face of the future” Jacob Markstrom — whom the team sent down to the AHL this season so he could maximize playing time — showing off his agility even underneath those bulky pads. We like to party too, Jacob. You’ll fit in great in South Florida some day.